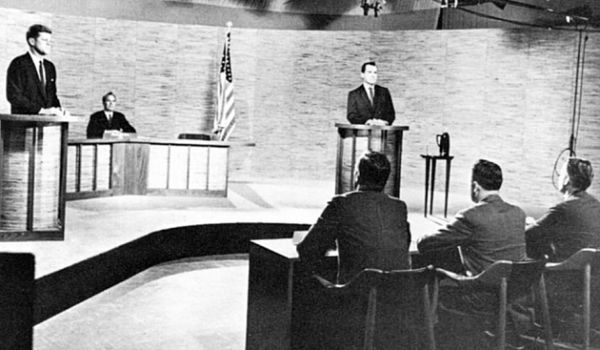 The first Kennedy-Nixon debate in 1960. In polls taken after the event, radio listners said Nixon had done better, while television viewers said Kennedy had done better. From August 29 to September 9, 1960 the Republican presidential candidate was confined to a hospital bed suffering from a dangerous infection in his knee. This created a problem for Richard Nixon since he had already made a strange pledge to become the first presidential candidate who would campaign in all 50 states. According to Theodore White’s account in The Making of the President 1960, Nixon’s frantic attempt at catch-up led to his wan, tired look during the first presidential debate. The 50-state pledge also required him to spend precious time visiting Alaska and its three electoral votes on the last weekend of the campaign. John Kennedy, spent most of that last weekend in the vote-rich Northeast, including a stop in the Bronx, where a precocious 11-year-old, your columnist, got to see his first presidential candidate in the flesh. Later I would get involved in numerous campaigns, mostly at the state and local level. There were two where I was part of the decision-making team, a statewide congressional campaign and a gubernatorial primary. In the others, I was primarily a foot soldier. Very few of these candidates won allowing me to continue my life trajectory as a political science professor and then a lobbyist for social science, rather than an aide to an office holder. Campaigns have changed tremendously since my last large involvement in the early 1990s, as technology, the diversification of media, and the changing demographics of the electorate, have become significant aspects of any election effort. Yet, identifying your supporters and making sure they vote remains the paramount goal. As we enter the home stretch of the 2016 presidential campaign, we have already had one illness-related event, and strategies and choices have been made that will surely affect the outcome. Although, the political science evidence lends credence to voter decision making before campaigns come into focus, there is also a belief among the combatants, their staffs, and the media, that presidential general election campaigns still matter. If they didn’t, hundreds of millions could be saved and the media would have to talk about something else. One fact that has changed campaigns since 1960 is the non-competitiveness of most of the states. There were times when Republicans won California (Nixon Ford, Bush 1) and New York (Eisenhower, Reagan) and Democrats won Texas (Kennedy, Humphrey, Carter) and Georgia (Kennedy, Carter, Clinton), but those days appear long gone. Nobody has made the 50-state pledge again. The successful nominee will have already established key staff to run the campaign during the quest to carry the party’s banner. Sometimes adjustments are necessary as McCain did in 2008 and Trump has done this year. He/she will also have demonstrated that funds will flow to the campaign. Since 2008, when Barack Obama refused public funds and so was freed from certain fund-raising restrictions, the sky has been the limit on how much campaigns can raise and spend. In addition, thanks to the U.S. Supreme Court, outside groups not affiliated with the campaigns can raise and spend dollars, too. The Democratic and Republican National Committees also have a role to play, but it is often limited by the respective candidates. How they use those funds reflects decisions on how the campaign will operate. Opening field offices in key battleground states to show visibility and momentum is one choice. In 2016, the Clinton effort has focused on this tactic much more than Trump. These field workers will carry out what is referred to as the ground game – finding your supporters, supplying them with campaign paraphernalia, getting them to the polls, including supplying transportation, on Election Day. Aiding this effort is the new technologically driven analytics that divvy up the electorate based on algorithms derived from demographics, market research, group affiliations, past voting behavior, and other individual characteristics. I attended a presentation by an Obama campaign practitioner of this art at the American Association for Public Opinion Research meeting in 2013 and found it quite awesome. Upon further reflection, however, it resembled a more sophisticated version of the old canvassing card and the Get Out the Vote (GOTV) activity still depended on old-fashioned methods. Campaigns have also found it useful to organize support groups, especially if they are people who would ordinarily favor the other side. Republicans for Johnson and Democrats for Nixon were two major examples. In 2016, the battle appears to be who can get the most national security folks on their side. I write this a few days before the first debate of the 2016 general election. These events often come off as joint press conferences rather than Lincoln-Douglas encounters. With a moderator(s) asking questions each candidate has been trained to say what they have prepared, including what appear to be spontaneous one-liners. However, since the first one in 1960, which many people still credit for Kennedy’s victory, and their resumption in 1976 (neither Johnson and especially Nixon would not debate), they have taken on extreme importance with instant polling on who won and endless discussions about key lines or gaffes. In 1988, CNN anchor Bernie Shaw’s question about what Dukakis would do if his wife was raped was a classic case of moderator chutzpah. In 1992, the presence of H. Ross Perot making the debates a three-way affair, allowed Clinton to let the Bush criticism come from the independent. There was also Bush’s glance at his watch, widely interpreted as “when will this ordeal be over?” I am not sure anyone, except maybe the participants, remembers anything from the 1996 Clinton –Dole confrontation. In 2000, Al Gore’s sighs and eye rolling in the first debate and his continued explanation of something called a “lockbox,” were the defining moments for press reaction. Despite generally thought of as the winner of all three 2004 debates, John Kerry still lost the election. Like John Kennedy in 1960, Barack Obama used the 2008 debates to convince the electorate that he was adequately prepared for the presidency and had as much stature as his more experienced opponent, Senator John McCain. This is clearly an objective for the Trump campaign tonight. Four years later Obama received huge criticism for his poor performance in his first debate with Mitt Romney, but survived to win re-election. Two other aspects of campaigns that have changed dramatically are advertising and polling. It started with the 1924 Calvin Coolidge campaign hiring budding advertising genius Bruce Barton and gained more prominence with the publication of Joe McGinnis’ The Selling of the President 1968, in which recently deposed FOX News President Roger Ailes had a starring role as a young adviser to Richard Nixon. The use of media – “Silent Cal” Coolidge was the first to use radio — and then television, and now Twitter and Facebook, and all their relatives have played significant roles in electing candidates. What has changed is the application of the analytics to target your message to particular slices of the electorate. Spanish language radio and TV have become especially important. In addition, groups, supposedly independent of the candidates, have increasingly used media to influence campaigns. We can see the switch by looking at perhaps the three most notorious presidential campaign ads since 1960. The first came from the Johnson campaign in 1964 – the Daisy Girl commercial. The other two came from two outside groups the Americans for Bush arm of the National Security Political Action Committee, which released the Willie Horton ad in 1988 against Dukakis, and the Swift Boat Veterans for Truth, which produced a negative commercial against Kerry in 2004. With the proliferation of media outlets, including social, and the narrowness of the battlefield, the advertising game has changed. You could live in a non-competitive state and never see a presidential campaign ad. However, you are also likely to see any controversial ones on the television or social media, which allows campaigns to save money on their advertising budgets. Lou Harris was the in-house pollster for the 1960 Kennedy campaign. 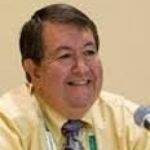 He used his success to boost his own firm and challenge what was then the major source of polling information, the Gallup Organization. Today there are so many different organizations conducting polls, including small colleges such as Quinnipiac in Hamden, Connecticut, that we need consolidators like The 538, Real Clear Politics, and The Upshot to keep up with all of them. What hasn’t changed is the use of in-house polling that will often ask more than horse race questions and will work closely with the analytics team. One other thing campaigns do a lot of is put their candidates before big crowds at rallies. These are wonderful for the morale of the campaign and staff. However, as John Kennedy pointed out, he got his largest crowds in Ohio and still lost the state to Richard Nixon. So as we head into the homestretch of 2016, the campaigns grind on. Yet, what seems most important at this point is whether there anything more Donald Trump could say or do in the next six weeks that would lose him any of his current supporters? Is there anything Hillary Clinton could do or say during this time period that would make her more acceptable and trustworthy to those who are wary? Stay tuned! This entry was posted in International Debate, News and tagged Debates, Polling, Presidential Election. Bookmark the permalink. Post a comment or leave a trackback: Trackback URL.